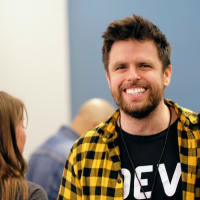 I'm an open source enthusiast at Mapbox, the creator of Leaflet and 40+ other JS libraries, and a rock musician. AMA! Hey! I'm Vladimir Agafonkin (aka @mourner) from Kyiv, Ukraine. In 2008, I started working on a small web maps library in secret from my boss, who insisted that I should stop "reinventing the wheel" and just use "mature, established solutions". When I reached out to the map developers community, my idea was ridiculed for "wasting time instead of contributing to existing projects". This little library, Leaflet, eventually became one of the most influential projects in the mapping industry. It is used by Facebook, GitHub, Foursquare, Evernote, Flickr, Pinterest, Etsy, Craigslist, European Commission, NPR, The Washington Post and the like, and has almost 22k stars and 600 contributors on GitHub. 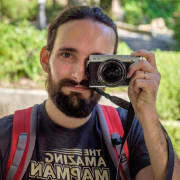 To keep track of all the open source projects I'm involved with, I created this list. There are many, thanks to Mapbox — I'm incredibly lucky and grateful to have the privilege to work on open source full-time, and do it remotely from Kyiv. Outside of engineering, I write songs, play guitar and sing in progressive rock band Obiymy Doschu. We've recently released an album we've worked on for 8 years. The lyrics are Ukrainian, but give the album a chance — if you like beautiful, evocative, multilayered rock music, it will speak to you nevertheless. I'm also a happy father of 4-year-old twin girls. 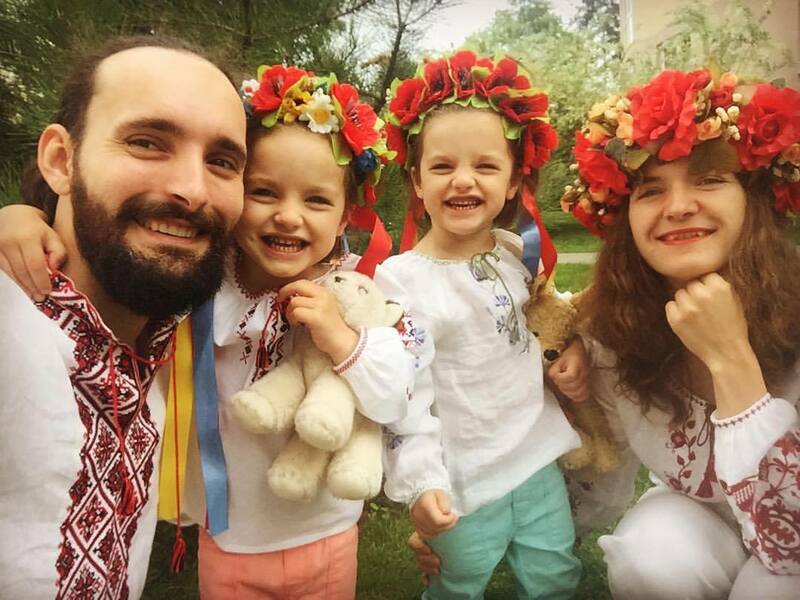 Here's me and my family celebrating Ukraine's Independence Day last year. I don't have any questions, and unfortunately I have never used Leaflet, yet. Just wanted to say that you seem like a really great person and I loved the letter you received from the 77 year old! You created the SunCalc library for calculating sun position, sunlight phases (times for sunrise, sunset, dusk, etc. ), moon position and lunar phase for the given location and time. How does it work and what are some interesting ways that people have used it over the years? The library came out of a website, suncalc.net, which I built more than 8 years ago and pretty much haven't updated since (you can tell by the fact that it still uses Google Maps :) — and I received so many wonderful e-mails about it over the years. I got letters from imams who used it for optimal prayer times, from a Tibet monk who used it to plan lunches, from air conditioner installers, from people who used it when choosing a home / apartment to buy, and from many enthusiastic gardeners. I use suncalc to work out Nautical Twilight for my app River Thames Guide (boats and ships registered in the UK should strike their ensign at 2100 or Nautical Twilight whichever is earlier). How did you get started in this area of combining geospatial and software development? Does it help to have an extensive GIS background when it comes to working with geospatial software? With the tools we have nowadays (especially thanks to you), it's pretty easy to work with maps without any GIS knowledge and it's often the case that they don't really overlap depending on the use case. Do you have any advice for people who want to break into geospatial tech (like myself), especially from the perspective of building tools? Sorry if any of them are unclear or if there are repeats. Thanks! I just got lucky — worked for a generic software consultancy in 2008 when our company got a client from the mapping industry, CloudMade. Then I learned about OpenStreetMap, online maps, got excited, and it started from there. Does it help to have an extensive GIS background when it comes to working with geospatial software? It probably depends, but in my case, it helped a lot to NOT have any GIS background. This way, I could build a mapping library from a perspective of a total newbie, making it simple and easy to use for others too. You can hear more about my background with Leaflet and mapping in this video. I'd recommend just jumping straight into building something, and learn along the way. Find a cool project idea that you'd feel enthusiastic to work on, and don't worry about having any knowledge gaps — practice is the most effective way to learn. Or find an open source project to contribute to. I know contributing to popular projects can be intimidating, but you can start small — e.g. even just fixing typos in the docs could be a good gateway, and then you build from there. Beyond bugfixes and dropping support for eg non-ES6 browsers, what do you see as future developments for Leaflet? I don't see Leaflet getting many new features — its whole point is to remain small, simple and lightweight, and given it's maturity, there's not much left to add. I'd actually be happy if we manage to remove some features. :) So the main focus would be on bugfixes, performance, refactoring it to make it even simpler, better docs, more examples, and more extensibility points for plugin authors. However, I won't be against taking Leaflet to a new direction if the community and its other maintainers decide that it's the right choice. Regarding that: What about any of those fancy frameworks with so-called "server-side rendering"? (I prefer the term "templating"). In particular: Do you think that the advantages of a SvelteJS port of Leaflet (e.g. ability to not use JS on the client) would be worth the problems (e.g. state transition animations, loss of canvas rendering)? I never thought about it, but it would be cool to explore. :) It's hard to imagine how a JS-less interactive map would look like though — like in pre-Google Maps era with a static image and buttons for panning that reload it? As I've always said, need some "mapping" solution for a problem you have? Check Vladimir's repos before anywhere else. We use Leaflet operationally on our public website for weather maps and other specialist maps. Needed a pole of inaccessibility calc for label placement on overlapping polygons, oh, Vladimir has polylabel. Do yourself a favour, check his repos first. On a personal note, thank you for all your effort, on Leaflet and on the more specialist libs. I really appreciate it and has saved me a lot of time. Very happy to hear that, thank you! What are your thoughts on 3D mapping? It seems that in the near future, with autonomous cars on the roads, there will be an amazing amount of point cloud data that should be mapped. Removing a dimension of that data to draw it in 2D seems wasteful. Technical limitations such as browser performance, computing power on a typical user's machine — those were pretty much solved. Browsers are now extremely fast, the unbelievably powerful APIs such as WebGL now have mainstream support, and most people carry unbelievable computing power in their pockets. And this change happened much faster than anyone anticipated. The complexity of dealing with 3D — building easy to use software and APIs, implementing sophisticated visualization techniques, etc. This battle is still ongoing, and my colleagues at Mapbox are working hard to help bring those technologies to widespread adoption sooner. I would personally want to thank you for Leaflet. It is an amazing tool ! There was a question below about it's future and I'd love this library to stay around for a while. Also, I've been wondering for a long time why it is not possible to rotate maps according to user's device heading. Plugins getting out of date is a serious problem, but adopting maintenance of other projects is not something we can usually do, as maintainers already have a lot on their plate. We have to rely on the community to keep most plugins maintained. What I'd love to do in future is creating a better plugin registry, with easy search, GitHub stars, version compatibility indication, maybe a badge of quality, etc — maybe that would help attracting plugin contributions and adding an incentive to keep them up to date. We might add rotation — there was even an attempt at this some time ago. It's just difficult to introduce rotation while keeping the code simple and easy to maintain, since it's a feature that affects most of the codebase. And there hasn't been enough demand for it to prioritize — usually rotation doesn't work well with raster maps (e.g. labels get upside down, etc. ), and works much better in vector maps libraries like Mapbox GL. Better plug in management would be a must ! Hi, mourner. I notice that many core vital algorithms are implemented by referencing academic papers. As reading academic papers are boring and tedious, how do you find one algorithm in papers that works? It can be tedious indeed, and most papers are beyond my comprehension. So with practice, I learned to skim papers very quickly — e.g. go through abstract, conclusion, then scan the pictures, look for algorithm pseudocode etc. Now I can determine if a paper is worth reading into in more detail after a quick skim. Looks like I'm a bit too late for the party, but still, I've decided to drop in with some words of appreciation. I'm using leaflet for my pet-project and although I can't appreciate it at full-scale as pet-project is something that you craft for 15 minutes per month still I've enjoyed using this library and was pleased to hear that the author comes from the same city as me. But what was the most surprising is that you're a guitarist of Обійми Дощу. This is really amazing how one can be both a decent software engineer and successful artist. Your path inspires me a lot! I attended Mapbox Locate recently and after Lauren Budorick's presentation on mapbox-gl I wondered if the power of GL could not be leveraged for performing spatial queries on geometric data that have already been loaded into a browser, as an alternative to turf.js on the front end. Is this something you've pondered, and/or do you see any viability in pursuing such a thing? WebGL is great for rendering large amounts of data, but is very difficult to use for actual processing and analysis. There are many research papers with geometric algorithms tailored for the GPU for massive parallelization, but pretty much no real implementations, and those algorithms use advanced APIs such as compute shaders, which are currently not available for WebGL and won't be for a while. Khronos is working on such an extension for the upcoming WebGL 2.0, but it will take a long time. Hey Vladimir! How much math would you say is involved in developing map tools and map development in general? Quite a bit when working on map rendering and when implementing geometric algorithms, but nothing you can't catch up on quickly online — mostly basic vector and matrix math. The most advanced math concept I ever used in my 13-year career is function derivative, and only once — it was a very unexpected use. Interesting, thanks for the response! Do you find that math influences your development and/or your music? Yes, but not directly — I feel like graduating Applied Math immensely helped me structure my brain and prepared me for hard challenges ahead, even though I don't remember much of what I studied. What do you think tech folks around the world could learn from the local scene in Kiev? What is the local tech community there struggling with the most? Affordable, heavily STEM-focused education system, with multiple world class universities in the city. While it can feel pretty outdated at times, it gives a very strong foundation (e.g. mathematics), which eventually produces many top-talent engineers. Abysmally low taxes, living and operational costs for engineers. It's very cheap to set up a startup team here compared to most other countries. Kyiv is also a pretty comfortable, walkable city with lots of greenery, great food, awesome subway system, tons of coworking spaces. A LOT of the top talent immigrates to Europe and US. Mostly due to corruption, inadequate government, bad social security and unstable economy. Hundreds of my Ukrainian ex-colleagues now live in Berlin, Amsterdam, London, SF & Bay Area. You'll find the diversity quite lackluster compared to the West — engineers are predominantly male, and there's a lot of gender bias (e.g. many people from the older generation think that girls don't need STEM education and instead have to find a husband and raise kids, cook and clean at home all the time). The situation is steadily improving every year though. Most of the tech scene is outsourcing — Kyiv is heavily lacking in product startups, although this gets better too. How do you keep from being distracted working at home with your beautiful twin girls? I have five children and it can be a challenge especially when I'm on calls. I also enjoy the commute (around 40 minutes by bus / metro) because it's a perfect time to read my Kindle or listen to a podcast. When I'm at home, on warm days, I usually work on our balcony, which is relatively quiet compared to the rest of our apartment. You have the gift of being a prolific creator. How do you prioritize your work and organize your time? To be honest, I'm absolutely terrible at time management and prioritization, and struggle hard to improve. Often, weeks and months will go by without getting anything of interest done. Pretty much all cool things I built were done on short-lived waves of enthusiasm, when I get obsessed with an idea and stop reacting to the outside world until proving that it works. This makes me really bad at sustainably working on big, complex projects. That's why I prefer creating very small, laser-focused libraries — it's much easier to get them to a useful state before throwing in the towel. Also, with experience, you start to get good at recognizing ideas with a high impact-to-effort ratio. When it comes to music, unfortunately, I spend a small fraction of the time on it compared to my student years. Otherwise we wouldn't spend 8 years to make one album. :) Hopefully, I'll be able to regain that area of my life more in future. What do you think are main pain-points of leading open source projects and what can be done to reduce them? Also, how do you mitigate burnout and frustration when dealing with people's "silly problems" (I don't mean it, I just can't find better wording) instead of really pushing your projects forward? Set up standard reply templates in GitHub, and close issues without hesitation. If a user feels entitled to your time while not willing to make any effort, such as filling out an issue template, providing a minimal test case, etc., it just takes away from people and issues that actually deserve your attention. Never feel guilty about open issues and messages you didn't respond to. You are a human being, with lots of things to worry about and take care of, and any issue can wait. Projects don't have to be perfect all the time. If an issue is critical and important enough and you can't find enough time to deal with it, other people will come to help you — it's open source after all, and otherwise it can always wait. Lock toxic discussions and block toxic people without hesitation — arguing with such people is not worth the emotional investment. Embrace and grow new contributors. Cherish people who show enthusiasm about your project, be patient when reviewing their issues and PRs even if they lack experience and technical skills, and they will grow to be an amazing help. Give away admin rights to your repos generously — putting trust in other people pays off big time. I got a big inspiration from you now. But how can I keep myself as engineer working with only programming; because sometimes it is really hard for me when above management trying to push me into management role and I don't want. Would you please give suggestion; I wanna stay in engineer path like you. Thank you! I was just always upfront about it — if management asked me about how I see my career going forward, I'd always answer that I want to continue solving difficult engineering challenges, and not interested in management roles. Currently Mapbox has 772 open-source repositories on github. That's too many for me to investigate or browse. What are your favorite ones? But since I'm involved with all my personal favorite ones, you can check out this list instead. Got tips for managing an open source community in terms of project direction, expectations, etc? Describing a set of simple core principles and goals of a project from the start helps a lot (e.g. in a readme or a contributing file). For Leaflet, the goal was to create the simplest, fastest and lightest mapping library that anyone could use — it's easy to align decisions with a simple, measurable goal like this (even if you have to reject contributions sometimes). It's also important to keep a project focused — a small library that covers 90% of use cases in a specific, narrowly defined area is orders of magnitude easier to maintain than a big one that tries to cover 100%. That means learning to reduce the scope, say no to new features, and proactively work on simplifying the project. Hello Vladimir. How did you first felt when Leaflet became so big that it is an industry standard? Was growing to that size slow or was it exponential? It was pretty sudden — I never expected it to get that big. This was my first ever open source project, and I still remember how I awe-struck I was when it got adopted by Foursquare (first major user) a few months after the public release. What are your thoughts about geodetic grids? Do you think they will be able to take over the tyranny of EPSG:3857 tiles? Could protobuf geodetic hextiles be a thing? Probably not taking over any time soon; at least for traditional web maps. The sheer simplicity of Mercator tiles is hard to beat. This is perhaps the biggest driver in the popularity of any software technology. The algorithms that power geospatial databases are designed for rectangular queries, and dealing with hexes would bring a lot of performance overhead. Since most existing mapping software works with Mercator tiles, you don't have to deal with compatibility issues. 99% mapping use cases only need accuracy at higher zoom levels, and don't deal with data around poles, so there's not enough incentive to switch to harder solutions. hello , in this post you have presented supercluster algorithme. i still didn't understand how to use it in a map. is there a clear tutorial on how to do that ? could we use it with folium map in python ? I have a question, do you know about the lib react-leaflet ? In case of a yes, could you post something about rotation ? especially a retangle, because I could do using just Leaflet but passing to react couldn't make it. So I was hoping if you could help. ps. Sorry for my english, It's not my native language. LTTP here but wanted to say thank you for creating Leaflet. I use it at work to display maps on our website with custom tiles and it works great! very humble, wish you success in all your life, thanks a lot for helping us. What do you think are the most valued competences you need to have a job like yours? The most valued competency is being kind and empathetic to others — it's not just a personality trait, but, as I learned, a skill you have to cultivate. Especially if you're a maintainer of a popular open source software — you'll interact with many people that had a really bad day. Also, in tech companies, communication skills are often much more important than technical proficiency. The other big one is curiosity — it's the core driving force behind everything I do. Diving head-first into challenging problems, constantly learning, experimenting fearlessly with everything, completely failing 20 times to come up with something amazing on the 21th. I'm pretty much in awe of your and your team's work on Leaflet. Thanks for that great resource, not only for making nice Web maps, but also for showing us how to code by reading your code. My question is: do you think it will be important for maps to become an internet media type, like video or SVG? Will this (script-less mapping) help get kids involved in mapping? You've made quite a lot of interesting pet projects. But how many pet projects have you not finished, or even not started? A lot! But it's fair — kind of a natural selection, where if a project is not exciting enough, I likely won't get it to a good state. There also lots of experiments I abandoned because it ended up not being a good idea. It's important to keep experimenting even if many ideas fail. What's advantage of mapbox vs other companies doing gis? An important distinction to make is that Mapbox is not a GIS company — it's a developer platform. So while some of our tools (such as Mapbox Studio) can be used directly for GIS purposes, the focus is on enabling other developers to create location-aware applications, and we excel at this. Pretty much everything we do is open source. This is a huge selling point, because our users can actively participate in the development of our products — they're transparent, not a "black box" like with some competitors. Thought leadership in the industry — we put an unusual amount of resources into research and development of innovative technologies that later get adopted in the industry, with competitors constantly playing catch up. Focus on open data. We rely on OpenStreetMap, OpenAddresses, Landsat and many other awesome open data sources, and only fill the gaps with commercial sources where necessary. Exceptional support — my team mates are some of the most loving, empathetic and talented people I know. To put it simply, an amazing product.